GAHS goalkeeper Alexis Nickels makes a save during the Blue Angels 7-1 victory over Piketon on Thursday in Centenary, Ohio. CENTENARY, Ohio — Seventh heaven for the Blue Angels. 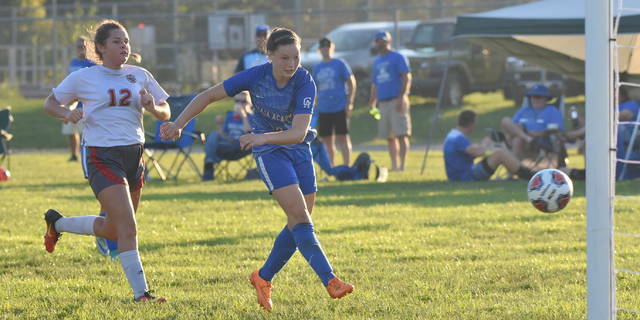 The Gallia Academy girls soccer team netted a total seven goals en route to earning their seventh victory of the season, defeating visiting Piketon by a score of 7-1 on Thursday night at Lester Field. GAHS (7-1) netted its first goal at the 38:56 mark, as Preslee Reed propelled the Blue and White to a 1-0 advantage. Reed added her second goal of the match 14:44 later to extend the lead to 2-0. Krysten Sanders scored in the 30th and 35th minute of the match to further widen the margin as the Blue Angels closed out the first half with a 4-0 lead. Following the intermission, Reed completed a hat trick when she scored at the 32:02 mark of the second period to push the deficit to 5-0. Koren Truance added Gallia Academy’s sixth goal on a penalty kick with 13:22 remaining in the match. Piketon cut the deficit to 6-1, in the 70th minute when Ally Crother’s shot found the back of the net. Reed tacked on her fourth goal of the contest with 0:30 remaining in the game, as the Blue Angels closed out the 7-1 victory. Gallia Academy outshot the Lady Redstreaks by a sizable 29-7 margin and also claimed a 4-0 advantage in corner kicks. 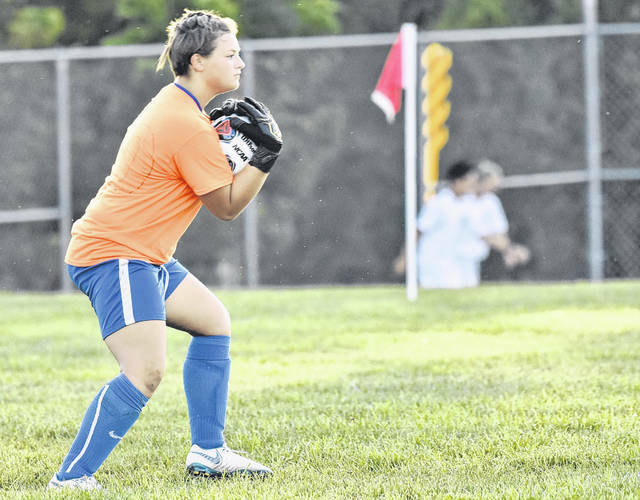 GAHS goalkeeper Alexis Nickels made four saves while earning a clean sheet win in net, while Cameryn Alexander stopped six shots in goal for Piketon. The Blue Angels return to action on Tuesday in an OVC contest against Fairland.